Greenock is in a stunning spot on the River Clyde, with magnificent views across to the mountains and beyond. It has no tidal or lock restrictions, and is accessible year-round for ships of all sizes. It is visited by a large number of cruise lines including: Princess Cruises, Royal Caribbean, MSC Cruises, Cunard, P&O Cruises, Fred. Olsen Cruise Line, Holland America, Azamara, Cruise & Maritime Voyages and -- for the first time this year (2015) -- Disney Cruise Line. It is also homeport to Hebridean Cruises, whose one ship, Hebridean Princess, has twice been chartered by HM The Queen. The town of Greenock is just a 5-minute walk from the terminal; walk up Lyle Hill and you'll get vistas of Loch Long, Holy Loch, Loch Goil, Gareloch, the Argyll Hills and a number of Munro Mountains on a clear day. 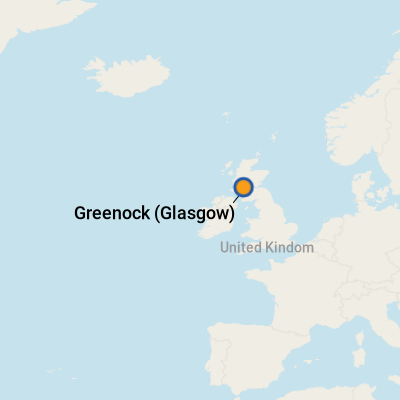 Greenock is is the port for Glasgow, which is 35 minutes by road or rail; it takes about an hour and a half to get to Edinburgh. Greenock Ocean Terminal has been recently refurbished and includes visitor information, shops, internet access and a bureau de change. Pounds Sterling, but note that Scotland prints its own notes so you may do a double take when you see one -- but it is legal tender. The nearest ATMs are in Greenock, five minutes walk away. For current currency conversion figures visit www.oanda.com or www.xe.com. English (with a Scottish accent).